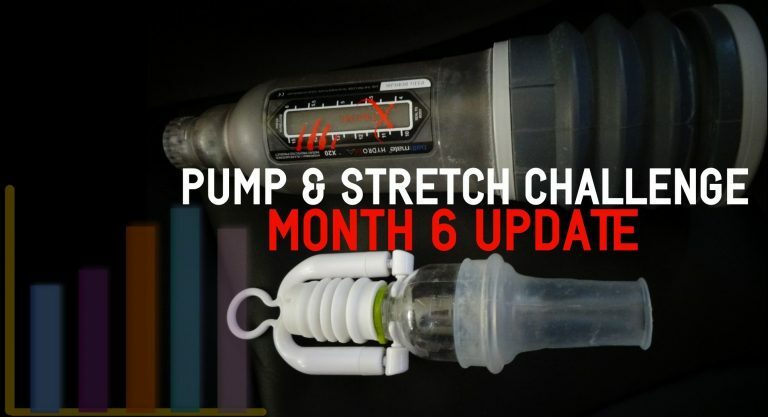 It is 6 months into the pump and stretch challenge, and that presents the perfect opportunity to compare my results with a 6 Month Clinical Study to see just how they compare. This will reveal how effective combination therapy of using a Bathmate and Phallosan is in producing results. Does using a stretcher with a pump work better than using a pump alone? Is it worth it? In my first round of using the Bathmate, back in 2012, data like this was hard to find. Few people really dove into the numbers of pumping and stretching, and even fewer compared them to a clinical study. Today, that is going to happen. You will get what I did not have when I first started, and hopefully it helps paint a clearer picture on the potential of combination therapy in enlargement. 2 How Do My 6 Month Results Compare? Despite last months call to arms to return to stretching after a dry spell in August, nothing happened. The troops did not deploy. I did not jump back into the routine of wearing a stretcher. Turns out I really am just a lazy arse. But, after the numbers I crunched below, that should all change. If it doesn’t, then I need some serious help, because what I found is pretty motivational! How Do My 6 Month Results Compare? One of the reasons why many men buy the Phallosan Forte – and with good reason – is the public availability of a clinical study for it. 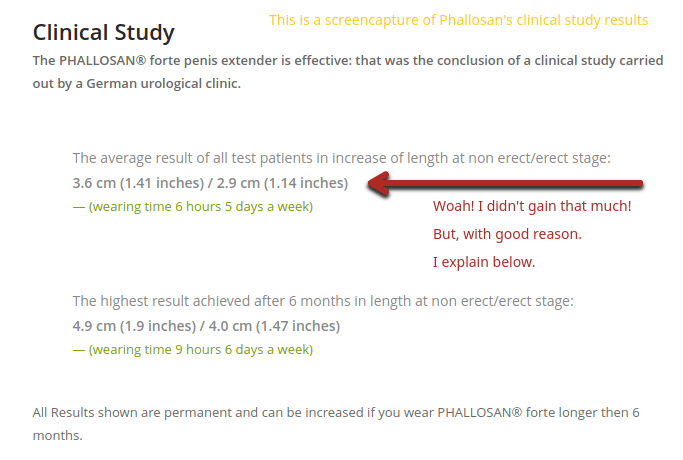 This study provides great data on enlargement with the Phallosan Forte. Finding the study on the website is easy too, which is something other enlargement companies rarely provide so publicly, if at all. The data I will be comparing to is the average amount gained over 6 months. For your own reference, see here. I’ve also provided a screenshot of it below. -In the Clinical study, the average amount gained over 6 months is 1.14 inches. In comparison to this study, I gained 54% of what the clinical study group did! At first glance, it would seem my gains are below average! But, before I let this idea take root, there’s one important piece missing, that when factored in shines a much brighter light on what would seem to be “below-average” results. The missing piece in this case is the # of hours used each day. In the clinical study, users wore the device 6 hours a day, 5 days a week, totaling 1065 hours of wear time over 6 months. Full disclaimer: I did wear the x4 for 28 hours during this challenge, BUT, I do not believe it had any significant impact on my results. For one, I wasn’t even able to wear it fully. I had one strap around mid shaft, and stretched that way because having the second strap around the head (as recommended) is too painful. Each session was short, and the stretch felt to be more on the foreskin than anything else. The important takeaway here is that I not only wore the Phallosan less, I wore it only 20% of the average total in the clinical study. Where it really gets interesting, is that my meager 20% was able to generate 54% of the average result in the Clinical study! What these numbers indicate is that using a pump with a stretcher, more than halved the amount of time needed to reach 1+ inches. This blows my mind, and to me points to the power of using a pump and stretcher together. Who doesn’t want to put in less effort and get better results? Back in 2012, when I first started testing enlargement, I never did the numbers, simply because I didn’t know if it would be worth the time. My enlargement experience started with just a Hercules, which I forced myself to use for an entire year. 4-5 days a week 10-15 minutes a day. It was a simple routine, and by the end of the year I gained .75 in length and .5 in girth. But, I never tracked growth as I went. After reading dozens of forum threads on PeGym and Thundersplace I decided that constant measuring was a recipe for disappointment. So I stayed away from it. However, tracking has put a whole new level of trust in the process. I can say with certainty that using a pump and a stretcher has been the most effective move I have taken in this experience. If you aren’t using a stretcher apart of your routine, you could be leaving easy gains on the table. If you aren’t doing this, you should seriously consider starting! And if you haven’t already, get your Bathmate from this official seller. The final measurements were taken Sept 30th, and compared to August’s final measurements. Kegels were again defeated this month! Right now, the only thing standing in my way of getting bigger is myself. I’ve tested using a pump with a stretcher, and seen results…. And I want to be the best version.